People say the only certain things in life are death and taxes. I believe that for people who been to Prague, googled Prague or simply heard about the city from others, there is another certainty. 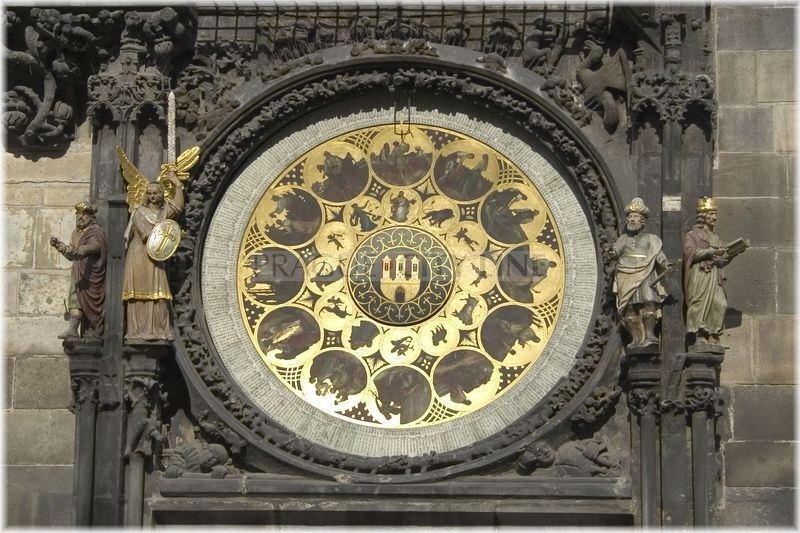 That is that they know about the impressive astronomical clock from the early 15th century in the Old Town of Prague. The fame of the clock is rooted in several factors. Not only that it can tell you time in four different ways, show you the movement of the sun and the current moon phase, it is also relatively unique in its scale. Other similar clocks in Europe are usually smaller. Furthermore, it has additional features such as the beautifully decorated calendar below the dial. If one is interested in a detailed summary of how the dial and the whole clock works, I suggest reading through this webpage. The most important feature of the clock, however, must be the complex mechanism inside the structure which allows for a performance to happen every hour on the hour for most of the day. This performance involves 12 apostles that are coming in and out of the two windows above the main dial. It also includes the four figures next to the dial. Three of which represent the sins of people (from left to right, vanity, greed, and lust). The fourth figure, the skeleton, represents death. 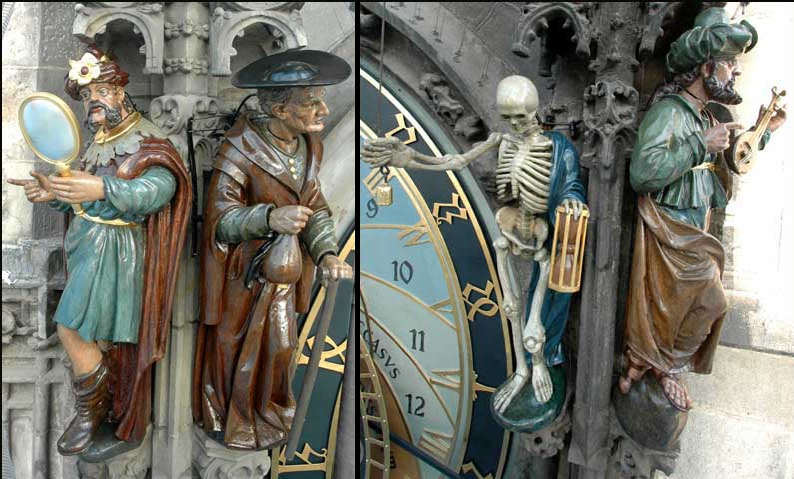 The skeleton is announcing the arrival of death via a bell and the sin figures are turning their heads ‘no’ in the last-ditch effort to avoid the dreaded end of their sinful lives. Once all the apostles see the light of the day, a golden rooster will announce the end of the performance. Usually, the performance occurs every day from 9 am to 9 pm. I advise people to either come early or late as the crowds gathering in front of the clock during the ‘rush hours’ can dilute the experience of the performance a bit. Perhaps one could visit the clock after they have finished a morning walk around the Charles Bridge at around 7 am. This is suggested by some of our tour guides to get a feel for the city without the crowds. 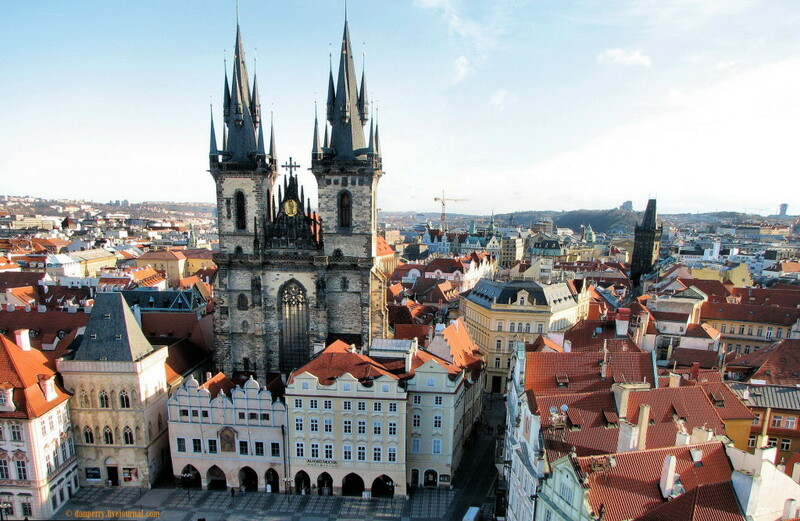 After you examine the clock you might want to visit the viewing pad of the Old Town Hall tower, which can provide you with the picture-perfect view of the surrounding Old Town square. 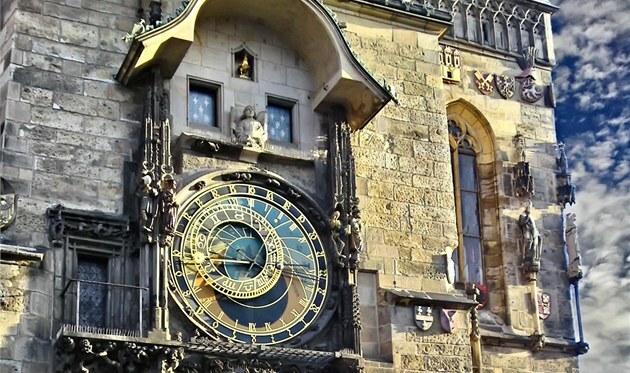 However, the best way to explore the area would certainly be with our tour of Old Town & Jewish Quarter which we run on a daily basis and which includes the astronomical clock as well. If you are visiting Prague now, unfortunately, the monument to engineering prowess is partially obscured as the astronomical clock is being repaired. It will be hidden until the end of October 2018. Do not despair, however, Youtube can provide a good representation of how the clock and the aforementioned performance look like. One can also stream what is happening in front of the clock in real time. Thus after October, you can watch the performance as it happens. I hope this has enticed you enough to visit the clock and see the real thing for yourself. It is a definite must in the lovely city of Prague.